Australian Shepherd Cartoon — "Frisbee?" Aussies love their Frisbees. The mere mention of the word "Frisbee" can make them go crazy. This is a quick sketch cartoon I did on a Wacom tablet in Photoshop (CS6). The annoyed little cat is based on my cat "Yoshie" who doesn't so much get along with my Aussie "Levi" as have an uneasy truce. They are pretty hilarious sometimes. 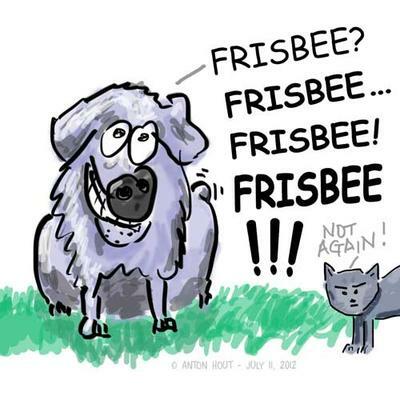 Comments for Australian Shepherd Cartoon — "Frisbee?" "Rascal" and I play frisbee in the back yard, "Glitter" my calico persian loves to watch. She sits up on the chairs so she can see and meows. Our Bengal cat likes to retrieve almost as much as the dogs. Bryn and Squatch also "play agility". We have a tunnel in our living room and they chase each other.